Photographic evidence shows a very strange object. This UFO sighting is very significant for many reasons. First, the reliability of the witnesses are beyond reproach. 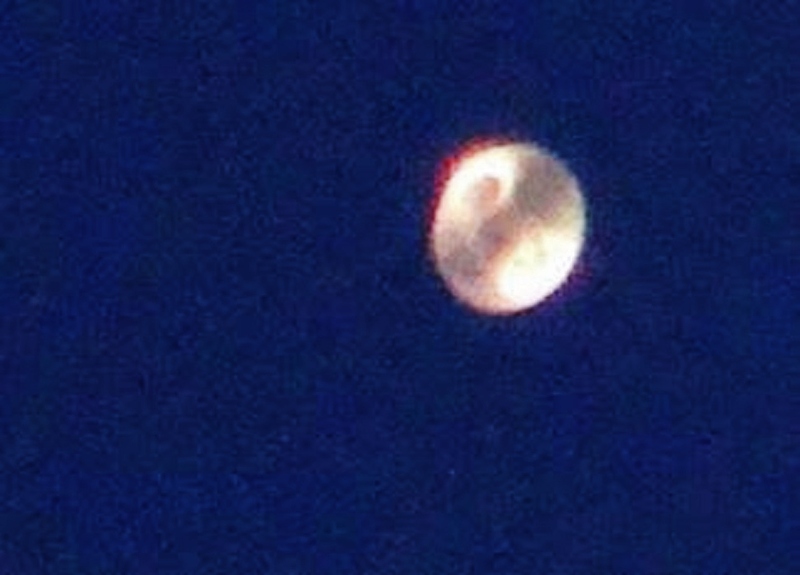 Second, the photographic evidence shows a very strange object, and if one looks carefully, two of the photos appear to show the silhouette of at least one occupant, possibly two. On Saturday, September 10, 2016, Pepe (fictitious name) and his wife, daughter and son were in the process of exiting their house to enter their vehicle. Son alerted Pepe about a bright light hovering above near the zenith. Pepe saw the light and remarked it was not only too high over the horizon to be the planet Venus, but also brighter. The object was stationary and to Pepe’s eyes it seemed to consist of two lights in one. Pepe asked wife to bring camera from the house and asked her to take a photo of the light. Wife took the first photo. Camera is an old Sony digital camera, model DSC-HX200V, with an integrated zoom lens made by Carl Zeiss. Wife handed over the camera to Pepe. Pepe took a photo. He waited a few minutes and when he tried to take another photo could not locate the object in the LCD screen. His son advised the object was still in the same place and after re-acquiring the object he took another photo. Pepe advised the three photos had different zoom settings. After approximately 7-10 minutes a large cloud hid the object. After realizing it would take a long time for the cloud to pass they decided to enter vehicle and departed area. From time to time Pepe pulled over the vehicle in order to try to locate object, but the cloud was still hiding the object. When the cloud finally moved away the object was gone. Pepe regrets he did not try to take more photos of the object at different zoom settings. He thought at the time the object lacked any features and was not doing anything. His overall impression of the experience is that whoever controlled this object wanted for him not just to see it, but to take photos of it. This entry was posted in ABDUCTION, best ufo photos, incredible ufo photos, MISSING TIME, top ufo news, UFO, UFO ARTICLES, ufo news, ufo photos and tagged 2016 PUERTO RICO UFO PHOTO, 9-10-16 SAN JUAN PUERTO RICO UFO PHOTO, ALIEN ABDUCTION, ALIEN CRAFT, animal abduction, army ufo, astronaut sighting, AUSTRALIA V SHAPED UFO, AUSTRIAL UFO WAVE, best ufo images, best ufo photos, best ufo pictures, best web site world ufo photos, BETHANY BEACH DELAWARE UFO, biggest ufo web site, boomerang craft, chief investigator, CIGAR, civilian panic, commercial pilot ufo, crashed disc, CYLINDER, cylindrical craft, diamond ufo, DISC, disclosure, discoveries on mars, discoveries on moon, DOVER AIR FORCE BASE UFO, FLYING SAUCER, government black ops, I.S.S. UFO, incredible ufo photos, international space station and ufo alien craft, january 2, january 29, KEN PFEIFER, ken Pfeifer discoveries, Ken Pfeifer State Director for MUFON in Rhode Island, Ken Pfeifer State Director for MUFON in Vermont, largest ufo photo website, largest ufo web site, largest ufo web site in the world, LIGHT, LIGHTS, marine ufo, MARS, mars discoveries, mars photos, MAY 3, MEN IN BLACK, MISSING TIME, MOON, moon discoveries, moon photos, mudjimba island ufo rectangle, MUFON, national press club ufo, navy ufo, no disclosure, OCTOBER 23, ORB, ORBS, pfeifer, PILOT MEXICO UFO, PILOT UFE CLOSE ENCOUNTER, presidents sightings, pyramid ufo, queensland australia ufo rectangle, radio ken Pfeifer, rectangle ufo, RUSSIAN UFO, SAN JUAN UFO PHOTO, Saturn discoveries, saucer, secret society, SEPTEMBER 10, SPACE ENCOUNTER, State Director Ken Pfeifer for MUFON in New Jersey, STRANGE, sun photos, swamp gas, TEQUESQUITENGO UFO CLOSE ENCOUNTER, top ufo news, TRIANGLE, ufo, UFO ARTICLES, ufo crash, ufo news, ufo photos | Tagged air force ufo, ufo presidents, UFO world ufo photos, ufo world ufo photos and news, underground ufo bases, underwater ufo bases, unidentified submerged object, unidentified submerged objects, uso, VILLA ZAITA UFO PHOTOS, world largest ufo web site, world ufo photos and news, world ufo photos is the largest UFO photo website in the world by KEN PFEIFER. Bookmark the permalink. However want to commentary on some basic issues, The site taste is ideal, the articles is in reality nice : D.
Hi there! This blog post could not be written much better! Looking at this article reminds me of my previous roommate! This course of begins if you purchase your supplies. is possible for you to to make from charging a competitive price on your jewelry. online moderately than from your local beading or craft shop, which a rebound to be dearer. try mixing a number of the cheaper beads with other extra engaging ones. and with any which might be enameled.